In 2013, students at St Stephen’s Elementary School in Halifax, Nova Scotia, cheered town criers in period costumes standing near the tree that would be sent to Boston. One hundred years later, Nova Scotia is still saying thank you. Officials from Nova Scotia’s Department of Natural Resources announced Monday that a 53-foot-tall white spruce has been selected for the annual holiday-lighting ceremony on Boston Common and will be chopped down next month to mark the centennial of the Halifax Explosion of 1917, when nearly 2,000 people were killed and 9,000 more were injured. Following the devastating incident, which was caused by a collision between a French cargo ship with explosives on board and a Norwegian vessel in Halifax Harbor, Boston quickly dispatched medical personnel and supplies to the region for assistance. The tree is meant to represent the strong bond formed between the two communities in the aftermath of the horrific event. 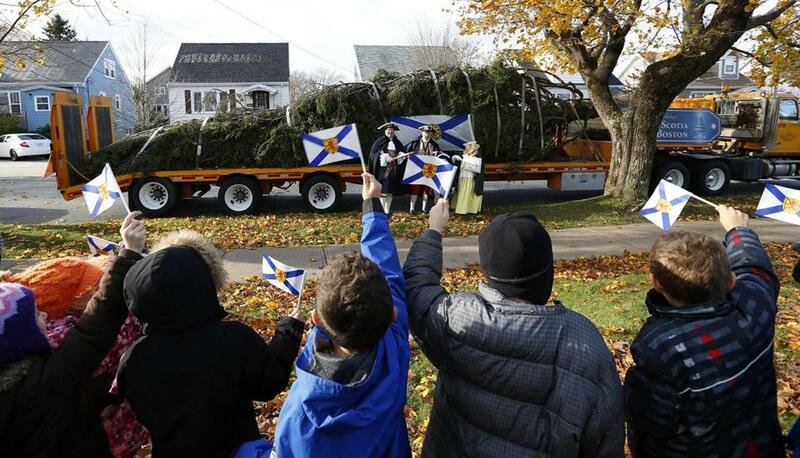 Nova Scotia has been bringing the trees to Boston each year for the celebration since 1971. This year’s tree will come from Bob and Marion Campbell, a couple from Blues Mills, in Inverness County, according to Canadian officials. After it is cut, on Nov. 15, the tree will be packed up and bid farewell. It will travel from Miller Lake, Nova Scotia, and to Boston, a three-day journey with stops in Amherst, Nova Scotia, and Bangor, Maine. The tree is slated to arrive on Boston Common Nov. 21 around 10 a.m. The city will hold its a tree-lighting ceremony, which attracts thousands of people to the public park and is broadcast live on television, on Nov. 30, according to event details. While the sentiment is enough to melt the iciest of hearts, taxpayers in Nova Scotia learned last year that the kind gesture comes at a price. In 2016, the Canadian Broadcasting Corp. revealed in an investigation that residents of the province footed a bill of $179,000 — in US dollars — for the cutting, shipping, and celebrations surrounding the tree’s journey to Boston. Of that total, the city received $30,000; WCVB-TV (Channel 5), which televises the local tree-lighting, took in $55,000; and an additional $6,660 was spent on festivities at the Omni Parker House for the Nova Scotia delegation, which was flown to Boston and put up in hotels at a cost of $9,600. The Halifax town crier even got a cut — $1,200 in travel expenses. Still, those up north said the tradition outweighed the costs, and helps put Nova Scotia on the map for New Englanders. “When you look at the entire scope of the thing, it’s a pretty good value for the province,” Stephen McNeil, Nova Scotia’s premier, told the Globe last year. Spectators can follow news and updates about the tree’s journey on Twitter. Steve Annear can be reached at steve.annear@globe.com. Follow him on Twitter @steveannear. Brian MacQuarrie of the Globe staff contributed to this report.